Bribery Scheme Or Just Friends? 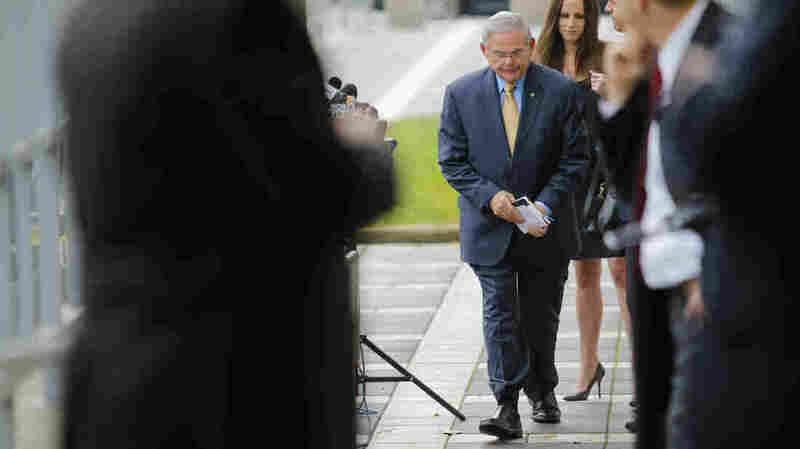 Sen. Menendez Trial Comes To A Close The Justice Department alleges Sen. Bob Menendez accepted gifts from a friend including flights, trips to France and the Dominican Republic, and large political contributions. Defense attorneys say the prosecution has presented a twisted picture of the friendship between Sen. Robert Menendez and a Florida eye doctor. Will a federal jury in New Jersey view a powerful U.S. senator and his wealthy friend as the yin and yang of a corrupt bribery scheme? Or will they see Sen. Bob Menendez and Florida eye doctor Salomon Melgen as two longtime friends who exchanged gifts and took vacations together? That tension was at the center of closing arguments that attorneys made on Thursday in federal court in Newark as the wide-ranging corruption trial of both men came to a close. The Justice Department alleges Menendez accepted gifts from Melgen including flights on the doctor's private jet, trips to France and the Dominican Republic, and large political contributions. In return, the government claims, Menendez used his power as a senator to help Melgen sort out a private contract dispute, reverse a Medicare overbilling charge and secure travel visas for the doctor's girlfriends. "Sen. Menendez held himself out as putting New Jersey first," federal prosecutor J.P. Cooney told the jury, "but the very first year, he became a U.S. senator, Dr. Melgen came calling with a better offer." Defense attorneys point to the lack of a smoking gun in the case and say Menendez and Melgen are simply old friends who sometimes discussed bona fide policy issues that Menendez later acted on in his role as a senator. Kirk Ogrosky, an attorney for Melgen, accused prosecutors of presenting a carefully curated narrative of events that intentionally omitted relevant information. "It's actually pretty terrifying," Ogrosky said of the government's case. "They took out-of-context emails and made a timeline that made things appear related that aren't." Closing arguments continue Monday, when defense attorneys and then prosecutors are scheduled to give arguments. Earlier in the week, Judge William Walls said a juror told him before the trial that she had a vacation planned for mid-November. If the jury does not reach a verdict by the end of next week, Walls will replace that juror with an alternate and instruct them to start deliberations over.